The main service of the business area Automation – Functional Safety is testing of electro-mechanical, electric, electronic and programmable electronic components and systems, which are intended for the use in safety-related applications. These products require a high degree of safety, reliability and quality, as they are responsible in their applications for the safety of personal and the environment. Today such safety products are very often also used in order to protect goods of value against destruction and loss. A fault in any of these products used within a safety function or external influences or faulty operation and other abnormal states can result in a hazardous condition for what has to be protected. By a type-examination of these products it is shown, that they meet the requirements of the relevant Standards and Directives and the specified characteristics of the manufacturer. The content and the different test steps in the various phases depend on the kind of product, the technology, the applied standards and the safety-related features of the tested product. Testing in parallel of the development has the advantage that the risk is reduced that the product does not fulfill the requirements at the end. There is no delay between the conclusion of the development and the completion of the approval and certification process. The product can be provided to the market with a valid certificate, which increases considerably the confidence of the users in the quality and safety of the product. The inspection items and the results are documented in a test report, which serves as the basis for the certification of the product by issuing a certificate by the certification body. The business area A-FS is accredited by the DAkkS as Testing Laboratory acc. to DIN EN ISO/IEC 17025. The examination results are reviewed and conformity assessed by the related certification body. 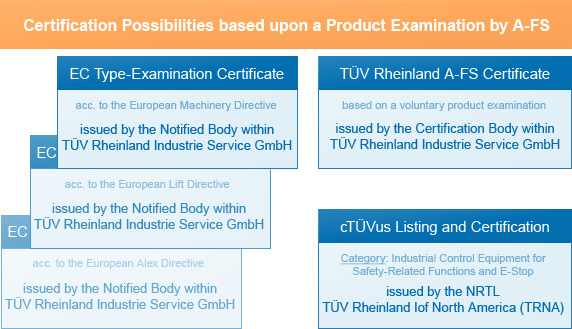 The following certifications are provided as result of the type-examination of a product by A-FS (see figure 2).